Cruising in remote tropical regions can be challenging, especially where there are no charts suitable for pilotage. Often the charts that do exist are old and inaccurate. To make matters worse, coral can grow surprisingly fast and what was a clear channel 20 years ago might now have coral heads just below the surface. In these situations the navigator needs to piece together every available bit of information in advance and Google Earth navigation is the way to go. We have been sailing our Grand Soleil 52, Streetcar, in the Pacific for over two years. During this time we have adopted a range of new techniques to supplement standard navigation and pilotage practices using publicly available satellite imagery to fill in the gaps and give us the confidence to explore off-chart. Most people are familiar with using Google Earth satellite imagery to explore on land, or even to see into their neighbour’s garden. Many cruisers are now finding satellite imagery can help with navigation. Coverage extends over coastal waters and captures most of the reefs and rocks associated with the land. In tropical zones the water is clear enough for shallow areas to be visible on satellite imagery. Even in murky lagoon water suspicious discoloured patches can be identified. 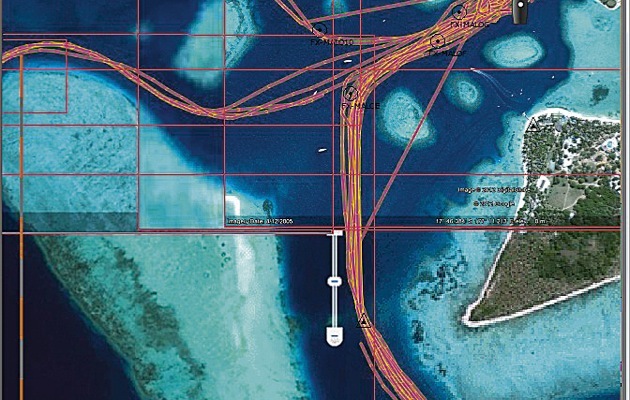 Conveniently, satellite images can be easily referenced to WGS84 for plotting GPS positions.These features combine to provide a powerful tool to support navigation and pilotage. In our navigation station we use a PC with a Garmin puck-type GPS plugged into the USB. Reception is good enough from the chart table, although this might not be the case on all boats. I use a PC with Windows because it’s the most common platform for all the various navigation software and avoids compatibility problems when exchanging files with other cruisers. You also need good-quality access to the internet to download the images. In some parts of the Pacific there is good enough mobile coverage to allow continuous downloading as you sail. Otherwise, you need to anticipate your areas of coverage and download when you can. SAS.Planet connected to other satellite image resources. With Google Earth you can pan along a proposed route and zoom into areas of interest. The detail is automatically adjusted as you zoom. You can even explore archived images to find the clearest pictures. If you connect a GPS, the boat’s location is shown on the images, although I find this can be temperamental in Google Earth. Google Earth saves (caches) viewed imagery up to a memory size limit. In the options you can maximise this cache size. This means that while you still have a good internet connection you can traverse a planned route zooming in and panning as you go along. Provided you don’t exceed the memory limitation, all the images will be available later when you are under way and not connected to the internet. Open CPN is freely available chartplotting software. It is the product of an online community of volunteer programmers. Electronic charts can be displayed and overlaid with waypoints, routes and tracks. And there is a whole range of additional plugins that add to the functionality. Using another freely available program called GE2KAP alongside Google Earth, you can create your own Google Earth charts. These can then be imported to Open CPN and overlaid onto navigation charts. You can toggle between the satellite images and the chart to compare features. SAS.Planet is another Geographic Information System, like Google Earth. It is a Russian freeware program, which is easy to download and does not even need to be installed. You just double click the downloaded file. 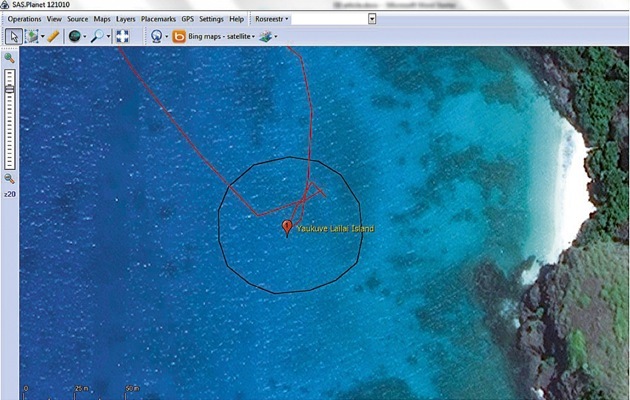 Many cruisers in the tropical Pacific are now using SAS.Planet because it provides access to images from other sources, such as Bing and Yahoo. In some areas these are better quality than the Google Earth images. Like Google Earth, SAS.Planet can be connected to your GPS so that you can see the boat’s position superimposed over the satellite images. You can also use it like a chartplotter to create waypoints and routes as well as record your tracks. The drawback with SAS.Planet is that converting the images into charts for later use in OpenCPN is not straightforward. So if you do not have access to the internet, you’ll have to rely on images stored in the cache. As with Google Earth, this cache is limited by the amount of memory allocated. With good internet coverage OpenCPN and SAS.Planet used together is our best option. In Fiji there is very good mobile phone network coverage and I can usually download images through SAS.Planet as we sail. When this is possible I like to run Open CPN alongside SAS.Planet so I can watch the chart and satellite imagery side by side. In order to run both at once on the same PC, I installed a piece of software that makes the GPS input available to both programs. I use Franson GPSGate, which is easy to install and use. In more remote areas you need to prepare all your satellite image charts in advance. Recently, we spent six months cruising through Tuvalu, Kiribati and Marshall Islands. Being ex-colonies, all these atolls have previously been charted. However, charts are dated and there are plenty of omissions and inaccuracies. We knew that satellite imagery was going to be a real asset. But in this region the internet is not good enough for downloading data. 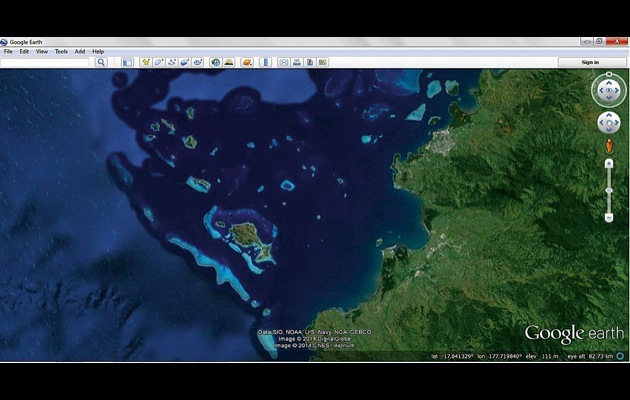 So before we left Fiji we used GE2KAP to assemble portfolios of Google Earth charts for all the atolls. 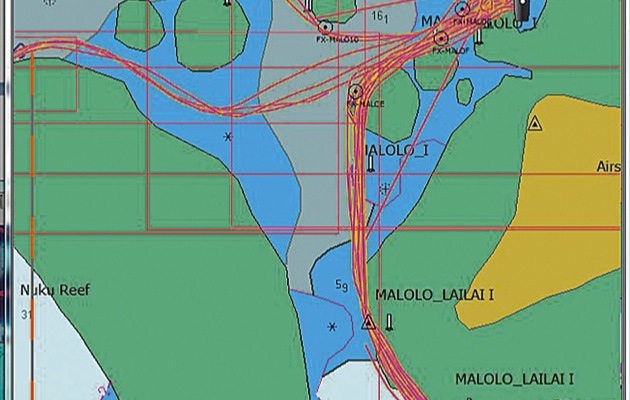 These Google Earth charts proved to be invaluable, allowing us to explore further and providing us with enough information to find useful protected anchorages around the lagoons. Those who have cruised atolls in convergence zone regions will know that you always need an exit strategy from your anchorage. Sudden and sometimes violent wind reversals can turn your idyllic spot into a lee shore with many miles of fetch across the lagoon. Having the Google Earth charts allowed us always to have a plan ready for these situations. Another benefit of taking time to collate this type of cruising information is being able to contribute to the communities of cruisers who cross your path in these remote areas. Thumbdrives full of Google Earth charts, tracks, waypoints, anchorages, etc, are the currency of these anchorages. It’s useful information, but remember to check for errors. Most cruisers write blogs and upload cruising information to websites. We always spend time going through these resources before heading off. We always check out the website www.noonsite.com, and some of the best cruiser resources for the Pacific are compiled by Soggy Paws on http://svsoggypaws.com. 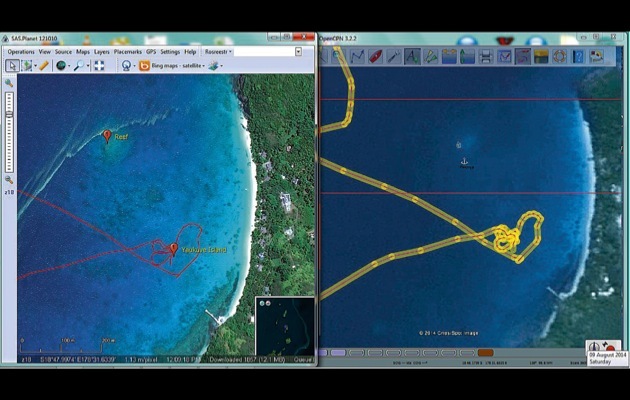 The use of satellite imagery for navigation in tropical areas is a huge step forward. It allows us to explore further with confidence and we can usually find alternatives if plan A doesn’t come off. But it doesn’t replace traditional methods of pilotage. We always have someone on lookout. The radar is always on to provide accurate measurement and the hand-bearing compass is at hand. I treat every piece of information with suspicion, especially when there are inconsistencies. The challenge is to separate the ‘fact’ from the ‘uncertainties’ and then figure out the best way to make use of the information. But I have found satellite imagery can contribute significantly to the ‘fact’ side of the equation. As they say, the camera never lies. Well, almost never.